It's plain and simple with just a tiny bit of detail to add character. The underside looks funnier! And then here's a photo of the finished object modeled by the recipient in a super awkward and uncomfortable stance. She doesn't mind the sweater, she's just always weird around camera's. She doesn't get why I'm squatting as if to pet her yet at the same time telling her to stay away from me... And she's squinting! Why do dog's and kids always have to close their eyes in pictures!? This was my first attempt at knitting for her. I'm pleased with the result, but mostly this sweater is just the prototype. I knit it using Dale of Norway/Dalegarn Falk yarn in a heather grey that I think suits her well. It took just about a week from start to finish, but the next one will be much quicker since I have all the proper measurements and have worked out all the kinks on this one. I won't have to be trying it on her every couple of inches to make sure I'm on the right track. The yarn was leftover in my stash. It was knit on 3.25mm needles. I think her next sweater will be knit out of TFA worsted weight superwash merino in Royal Flush. I think she'd look great in red. And for all those people who think that dog's in sweaters are ridiculous, I ask you not to make fun of my skinny little whippet. She'll get cold in the fall since she has so little body fat. I'm doing it out of necessity, not vanity, but I still think she's going to look great in red! Lately I've been pretty preoccupied with trying to come up with patterns that would really highlight my hand dyed yarns. My intent is to design my own original patterns for my yarns, but I'm not quite a designer yet, I'm working on it. Right now though I'm practicing by knitting other people's designs. This is Ilga Leja's Diamonds on the Diagonal Scarf. I'm knitting it in Fleece Artist Merino 2/6 in the Tangerine colourway. I know it doesn't make any sense that I'm knitting it in Fleece Artist since the whole point is that I'm looking for way's to highlight MY YARN, but I had this skein of Tangerine, and I've never actually knit with Fleece Artist before, and I lost focus and on impulse cast on with it. I love the pattern! It's simple and crisp and clean and exactly the kind of thing that would suit my tonal colourways. I'm not nuts about this Tangerine though, first of all, since when am I so in to orange? I think that I just try so hard to branch out and expand my colour spectrum that I've ended up going way too far in the opposite direction from what I naturally gravitate towards. Typically, I would always chose blues, but because I'm trying to diversify I'm doing a total 180 and knitting with orange. Go figure. 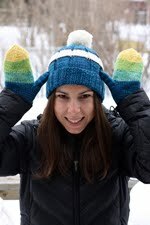 When I knit this pattern with my own yarn I'll have to chose a blue. Besides the colour, I've also noticed that this skein contains quite a few un-dyed spots, can you see the white spaces creating a sort of "V" on the top of the photo? I'm not a big fan of that, I may end up over-dyeing the whole thing when I'm done. Today my best friend Lydia and I decided that it was about time that I teach her how to knit! She's almost 25 for crying out loud! All those years she could have been knitting but didn't know how! I really hope she gets addicted! I think that this scarf pattern would make a great second or third project for her, it's simple, but impressive, and teaches a lot of knitting basics. 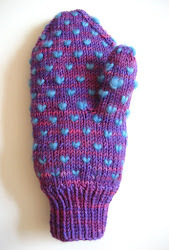 So, speaking of me trying to become a knitwear designer, I'm working on my first original fair-isle mitt pattern. The work in progress is pictured bellow. I've worked out a lot of the kinks and by the time it's done it will most probably look completely different (I'm now not sure about the colours or the pattern!) but at least I've worked out guage, length, width and thumb placement, which are all big things. I'm going to rip the whole mitten out and start again, hopefully it'll only take one more try. last but not least, here are some pictures of my rovings! Remember how I mentioned in my last post that I wanted to become a spinner? Well, I've taken the first step and started a fiber stash! I still don't have a spinning wheel, or a particularly firm grasp on how to turn fiber into actual yarn, but I'm heading in that general direction. Then in a moment of weakness I logged on to Coloursongs yarn and pruchased these six 50g Fleece Artist slivers. Just enough of each to hopefully make a bit of pretty yarn to stripe a hat or add detail to a scarf project. From left to right we have Silk Merino sliver in Cosmic Dawn, Peridot and Hercules, Wenleydale Teeswater Sliver in Mermaid and Blue Face Leicester Sliver in Seashore and Peridot (Notice how different Peridot looks in Silk Merino versus Blue Face Leicester!) I'm very excited to work with all these fibers. The silk merino feels like a dream and confirms to me that the next yarn I add to Tanis Fiber Arts collection (after the worsted weight merino that's coming any day now) has got to have silk in it! Or at least something luxurious and shiny like bamboo or soy. I'd better learn how to spin soon! Back to back posts! Who would have ever believed that this could happen! As anyone who has ever tried their hand at blogging, or even journal writing knows, keeping up to date with it on a daily basis is really hard! For me, I think that hardest part is the photo's. I feel like it's important for a knit blog to have images of knitting, and getting good photo's, with good light, and a non professional camera is pretty tough. But, here I finally got some photos of my finished Razor Cami. 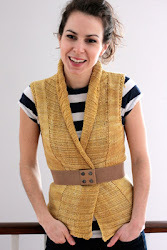 I knit this cami using Garnstudio Muskat #47. It's a very bright shade of orange, I probably would have proffered a slightly lighter tangerine colour, this colour isn't really that "me", but I can certainly live with it. I received compliments on it both times I wore it by people who didn't even know that I made it! I think that there's just something about a hand made object that people are drawn to even if they don't necessarily know why. Something that's been hand made always looks special. So, though I'm pleasantly surprised and pleased with the results of my first summer knitting project, and also my first cotton knitting project, I don't know that I'm going to start making tank tops and camisoles in every colour. I will definitely be knitting with this gorgeous yarn again though. I'm a sucker for shiny things, and this cotton has just the right amount of gleam. I really like it's drape too, I think it would make really nice, flattering v-neck sweaters. On a totally different note, y'know how most knitters have cats, it's kind of a "thing"? Well, I have a dog, but she's remarkably cat-like! She jumps on, off and over the backs of couches, she lays on window sills in the sun-shine, and she LOVES balls of yarn! She loves them kind of in the same way that knitters do, not in a destructive way, but in a loving way. If a ball or skein of yarn is left unattended on the couch, she will always curl up with it, it's very cute. That's another thing she has in common with cats, she sleeps in an adorable little ball shape... next to knitted things. Tonight, I've cast on for my very first dog sweater. I never thought that I would be the type of person to make sweater's for a dog, but whippets have so little body fat that they need clothing to stay warm during our cold Montreal winters. Actually, I had to buy her a doggy parka for the actual winter, I think sweaters will be more appropriate for Fall and Spring. I'm keeping it very respectable though, I'm knitting a simple heather grey sweater with perhaps one cable down the center back, no feathers or glitter or silliness for my elegant Stella. Hi Sean, as you know Chris, Stella and I just got back from a weeks vacation at my cottage in beautiful Nova Scotia. Despite the clouds and the rain, we still had a wonderful time. Though it was pretty dreary most days, we did manage to get one sunny afternoon! Because of the weather we didn't spend much time on the beach unfortunately. We had a couple nice walks and Chris was a real trooper and went swimming everyday (sometimes even in the rain.) Most of our time was spent indoors reading, playing cards and board games (some of my favorite things about my cottage, after the beach.) And of course knitting. Stella got along really well with my parents dogs, it was so cute to see her cuddling with them! Despite all of the available knitting time due to the weather, I surprisingly only got one completed sock out of the whole week! Here's a dreadful photo of it. It's knit in Tanis Fiber Arts Moss colourway, using the Retro Ribbed Sock pattern from my Favorite Socks: 25 Timeless Designs from Interweave book, and I'm very pleased with it! 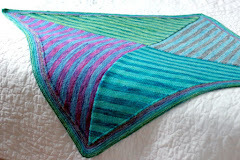 It's a new colour and it's always exciting to see how new colours look when knitted up into completed objects. This close-up of the foot shows how the textured pattern really shows off the yarns subtle variations in tones. 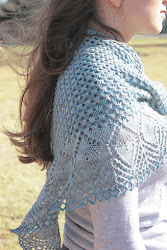 I think that this once again proves that lace patterns and texture are really well suited for my tonal yarns. I think that my dad will love these socks. 50g of thick-thin, artsy wool yarn (I'm calling it "artsy" because that makes it seem like maybe it was intentional or something.) The kit included 100g of three different colours of wool fibre. I spun half the brown first, because it's my least favorite colour of the bunch and I figured I'd try and work out some of the kinks on it. All in all, it's not as bad as I thought it would be. I also bought 200g of some lovely blue/mauve/grey roving dyed by the folks at London Wul and once I'm all good and practiced on my roving from my kit, I'll move onto the really pretty stuff. I'm hooked. I'm definitely going to buy a spinning wheel this fall! Hopefully more spinning news to come!